This first chart for tonight is the GOLD:XAU ratio combo chart we’ve been following very closely. I just want to make it perfectly clear what this ratio chart is telling us. 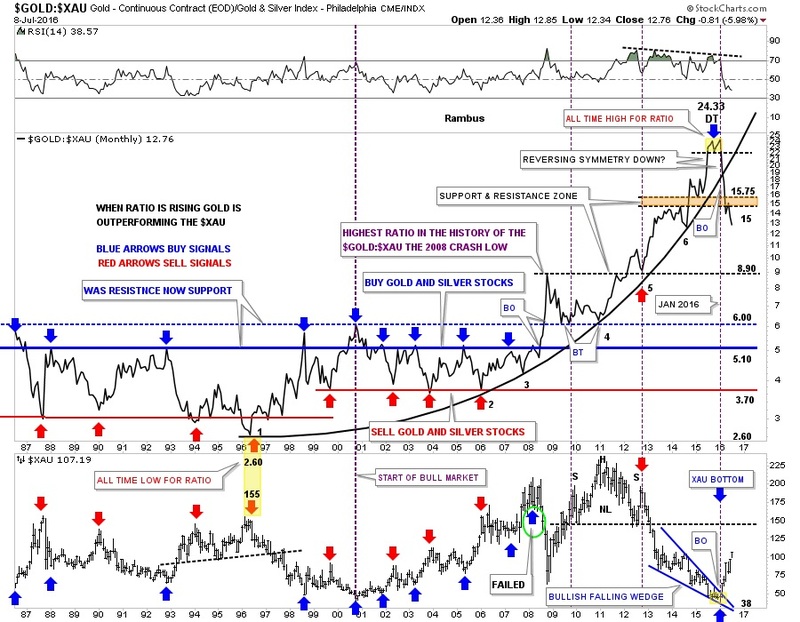 The ratio chart on top is telling us that gold is in a parabolic collapse vs the XAU after 20 years of out-performance. Even though they can both go up together the XAU stocks are going up parabolic to gold as shown by the vertical move down in the ratio and the vertical move up in the XAU. When the ratio broke down from its double top all-time highs at 24.33 there has only been one month, May, that the ratio had a small rally and backtested to the bottom of the S&R zone at 15. You can see the same thing happened on the XAU chart at the bottom, where it just went sideways in May. We are witnessing an unprecedented rebalancing of the precious metals stocks to gold. This started in January of this year and shows no signs of abating. If you’ve been a precious metals complex investor, or as some like to call them gold bugs, this is the absolute best buying opportunity in 20 years to buy your favorite precious metals stocks. The unwinding of the parabolic 20 year arc is something you don’t see every day and to be on the ground floor of the rebalancing move should be very rewarding if one can stay in the saddle. Below is another ratio chart in which I compare the HUI to gold. When the ratio is rising the HUI is outperforming gold. 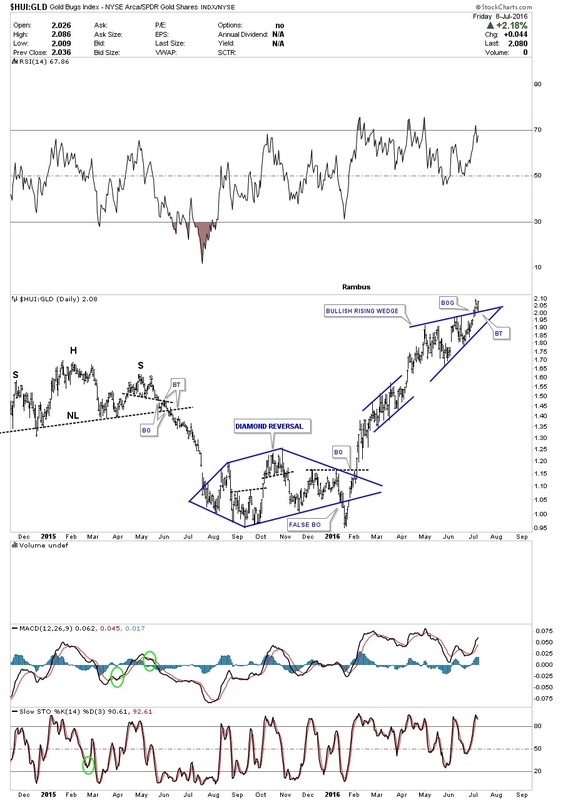 If the ratio chart above has any validity then we should see the HUI rising in a near vertical move vs gold. After building out a Diamond reversal pattern at the bear market low, this ratio has been in a strong impulse move higher. Note the breakout and backtest to the top rail of the current bullish rising wedge. As long as the apex holds support we need to let this ratio fulfill its destiny. 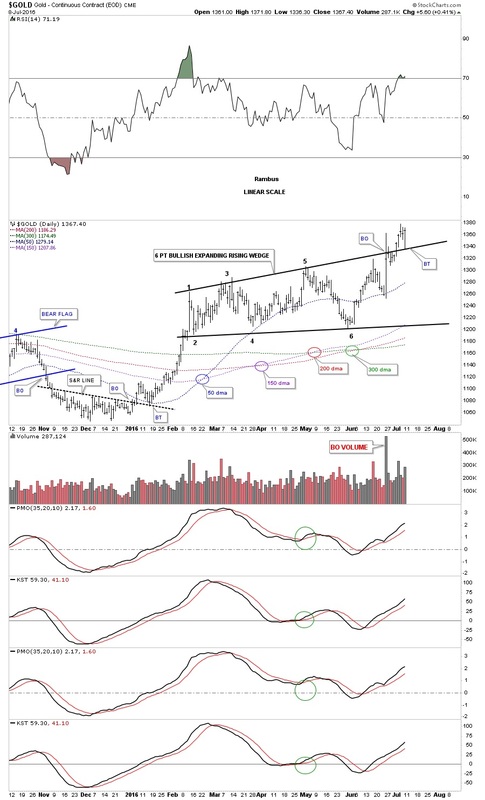 This next chart is a 10 month daily chart for gold which shows the breakout and backtest to the top rail of its six point bullish expanding rising wedge. If gold is just now breaking out in a brand new impulse move up, what does that say about the GOLD:XAU ratio chart we just looked on the first chart above? In order for the ratio to keep falling in a near vertical manner, as it has been doing since January of this year, the PM stocks are going to have to go up faster than gold itself which they’ve been doing since January. Note the huge volume bar on the breakout from the six point bullish expanding rising wedge. Also note the backtest to the top rail that took place this morning. These are major clues that this consolidation pattern is mature and ready to make its next move. This chart also has what I consider to be the most important moving averages for gold. The 50 day simple ma has held support except for the move below it at the sixth reversal point in the bullish expanding rising wedge. It even held on the big volatility day when gold broke out from the bullish expanding rising wedge. As you can see all the moving averages were slopping down coming into the December 2015 bottom. It took until last month June, for all the moving averages to have a positive crossover when the 200 finally moved above the 300 day moving average which was the last piece of the puzzle for the moving average alignments. They are now all proper aligned for the new bull market and pointing up. 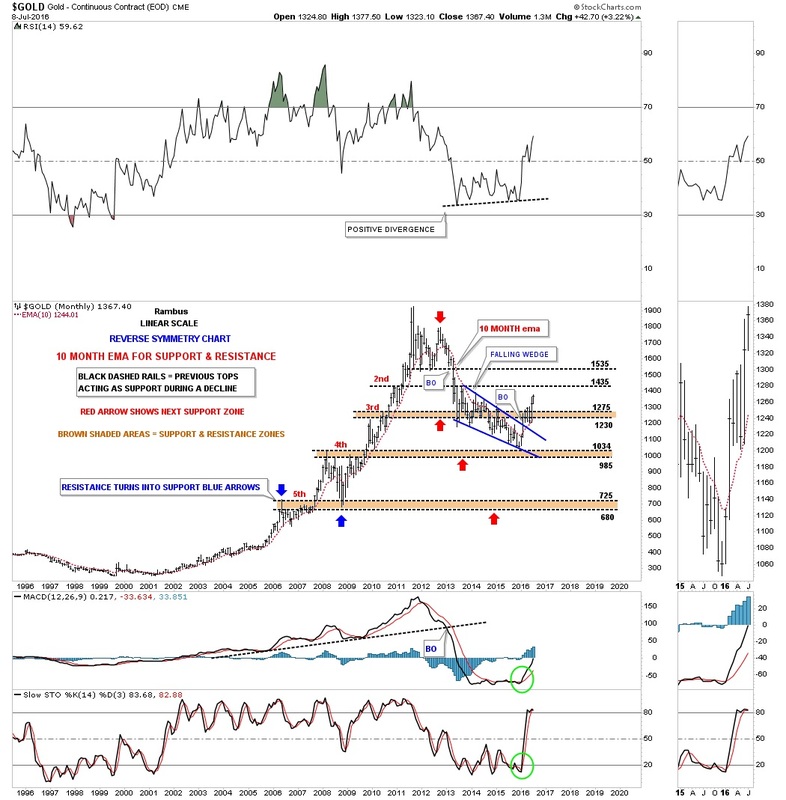 The longer term daily chart for gold shows the rally off the 2008 crash low and how all the important moving averages aligned to show the bull move that took place. During that big bull-run up to gold’s all-time highs the 150 day moving average was the one moving average that held support the best. It was never violated until the first move down from the 2011 top which also tested the 200 day moving average for the first time during that epic run. 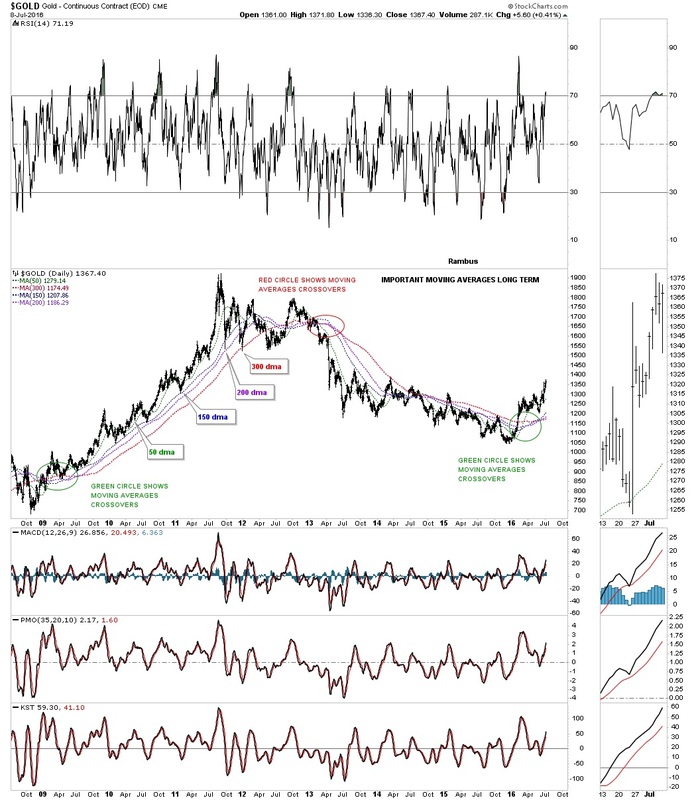 The 20 year monthly chart for gold shows how well the 10 month ema held support during the bull market years and resistance during the bear market. Note how the 10 month ema has reversed its role back to support on the rally out of the bear market low at 1035.